This site is a comprehensive discussion of Bullpup Rifles and Bullpup Shotguns. Follow the linked forum logo below. Shooting sports are inherently dangerous. Any discussion, advice, and/or experiences should not be taken as expertise. Always follow manufacturers recommendations, all laws and rules for your location, and above all apply common sense, siding with safety first. This week's featured Bullpup is the Steyr AUG. This iconic rifle, first captivated the world in 1977. And even after 38 years, this rifle is refered to as futuristic. Assembled by Steyr-Mannlicher-trained gunsmiths in its Alabama manufacturing facility, Steyr Arms is the US subsidiary of Steyr Mannlicher. Overall length of 28.15 inches with the 16-inch cold-hammer-forged barrel, and the legendary tulip-style muzzle brake. Easy conversion to left-handed operation with an optional left-eject bolt. The AUG is the flagship of the Bullpup world!! 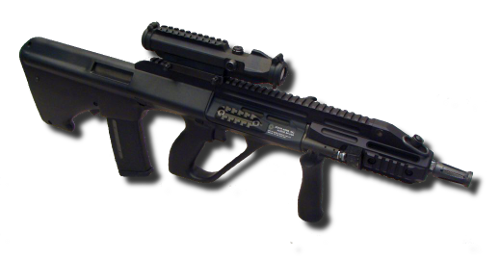 This site is a comprehensive forum about Bullpup rifles and shotguns. From the iconic and universally recognized Steyr AUG, to the precision bolt action sniper bullpups, to the 12 gauge bullpup scatterguns, all the way to the rim-fire bullpups, BullpupForum.com is the site dedicated to those who love Bullpups! This is a public forum, so please take any discussion as information, but that does not infer that the information is accurate, safe, or complete, and should never be relied upon as expertise!